You all remember Julie Andrews of the Mary Poppins and Sound of Music fame. Well, if there is truth to the claim that art imitates life, then that must be said of Julie Andrews. She not only took on roles that were stereotypically sweet, she was in real life, one of the sweetest persons in show business. Julie Andrews gives off goody-two shoes vibes. It is as if she could do no wrong. Her husband, Blake Edwards, was reputed to have described her as being “so sweet she probably has violets between her legs.” I often wondered what life must have been like for Blake Edwards, to live with such a beloved woman. Some would have postulated that it must have been wonderful. On the other hand, it must also have been difficult for Blake Edwards, as it’s never easy to live with a saint. If I were to say “Everyone hates a saint!” Do you find this shocking and scandalous? But let’s be honest, which of us enjoy living or working with a saint: those sanctimonious, self-righteous, Pharisiacal, holier-than-thou individuals who strut their sanctity and wear holiness like a badge, and who constantly reminds the rest of us that we are wallowing in the mire of our sinfulness. No, in truth, no one likes a saint. They tend to show up our faults more than anything else. If being around a saint is tough, try becoming one. It’s often the quickest way to lose popularity and one of the most efficient tickets that will get you killed. It’s certainly tough being a saint in today’s day and age. It’s so hard to stay “good” and do what you believe to be right. As much as we often start of trying to live up to the call of holiness, the company we keep inexorably drags us down into some unsaintly activities or lifestyle. It seems to be a simple matter of survival if you wish to fit in. It’s so much easier to act “bad” and behave like the rest of the motley crew of sinners, reveling in their sinfulness and finding comfort that we are “real.” Without a doubt, there is no denying that it's a tough time to be a Catholic today and to live up to your Catholic values. It’s so much easier to hide your religion, to hide your “sanctity.” Who wishes to be derided by that ad hominem remark, “Don’t try to be so holy?” or be called “Holey Moley” or be accused of being “holier-than-thou.” The new normal is “bad.” Holy and good people are just unrealistic anomalies. Saintliness is the subject of derision because the larger traditional concept of a hero has suffered a greater blow in recent times due to popular culture. A saint is supposed to be an example of heroic faith. The problem is that it is no longer novel to be just a hero – the story of the gallant and noble hero who rescues the maiden in distress. This is just too boring for a world that craves for innovation and the unfamiliar. Therefore, we are beginning to see emerging in cinematography, literature and music, a glorification of the bad, the demonic and the villainous, which were originally seen as the antithesis of heroism. Thus the anti-hero has been canonised in songs like Michael Jackson’s, “I’m Bad, I’m Bad”, vampires in the racy TV series True Blood, Casper in the cartoons, the demonic Hell Boy, witches and wizards in the Harry Porter series. When the lines are blurred, one can’t tell the difference anymore between good and bad, saint and sinner. In fact, it has become quite popular to vilify the saint and canonise the sinner. But while we all might have to suffer insults, we should indeed rejoice. It's a great time to be a Christian, because this is a time in which God really needs us to show off his true face. Jesus says in the beatitudes we heard today, especially in the last one, “Happy are you when people abuse you and persecute you and speak all kinds of calumny against you on my account. Rejoice and be glad, for your reward will be great in heaven.” I've been experiencing that beatitude first hand, when I made a conscious decision to don my black clerical garb. It was not just the stares that I often get when walking with my cassock in public but also the snide remarks and concerned advice from laity and fellow priests who thought that I had fallen off my rocker. It ranges from the more innocent, “have you just returned from a funeral,” to the curious inquiry, “is it not hot?” to the more caustic, “trying to be different ah?” The subtext of the last comment is that I fit perfectly into that stereotype of Pharisees who wear their sanctity on their shoulders, with protruding phylacteries and long tassels. Yes, in the past, it was regarded a good thing to be holy and good. It’s not any more. In today’s world, holiness comes across and sanctimonious self-righteousness, and generally a tumour that has to be excised from the rest of the community, if the latter is to survive. 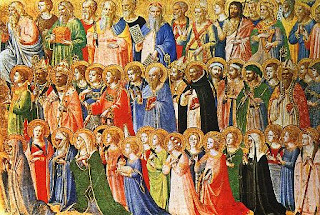 The Catholic Church’s celebration of the feast day of saints, its continued practice and tradition of canonising ordinary men and women as saints, certainly goes against the tide of this prevalent trend. As opposed to the world, the Church is making this loud claim, “we love our saints!” Almost every day of the liturgical year is dedicated to a saint. In other words, during an entire liturgical year, the Church provides us with so many heroic examples of faith and holiness. We don’t seem to have enough of them. Pope Saint John Paul II, during his pontificate, had canonised more saints than all his predecessors. When asked why he did so, his reply was this: “In a world that is faithless, we need more models of faith. In a world that is hopeless, we need examples of hope. In a world that is so full of violence and death, we need shining beacons of peace.” In other words, by venerating and honouring the saints, the Catholic Church re-establishes the perennial norm for humanity – it isn’t about being bad but about being holy. Saints are supposed to be the norm, not the anomalies. 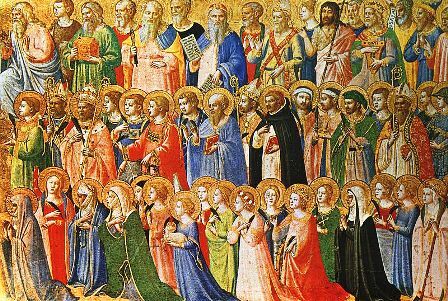 That’s who saints really are – they show all of us, not only Christians, what it means to be fully human. St Ireaneus says, “The glory of God is man fully alive, but man fully alive is man glorifying God.” But unlike the humanised version of a hero or the recent abomination of the anti-hero, these Christian heroes are mirrors which allow us to see the goodness, the greatness and the love of God. They give a face to the invisible God. One of the greatest Catholic preachers in American history, Bishop Fulton J. Sheen, the father of TV evangelisation long before the Protestant evangelicals discovered this medium, used to say, that he preferred to live in times when the Church has suffered rather than thrived, when the Church had to struggle, when the Church had to go against the culture. It was a time for real men and real women to stand up and be counted. “Even dead bodies can float downstream,” he used to say, “but it takes a real man, a real woman, to swim against the current.” This is a time in which all of us need to focus ever more on holiness. We're called to be saints and how much our society here needs to see this beautiful, radiant face of the Church. This is one of those times. It's a great time to be a Christian. It is wonderful time to be Catholic. It is a necessary time to be a Saint. And in any event, living with a saint beats living with an idiot.